After months of hype and trying to avoid blatant spoilers, I sat down to watch Dragon Ball Super: Broly on opening night. And oh, did this movie deliver. My eyes were glued to the screen as I tried to drink in the backgrounds and appreciate every movement. There will be some mild spoilers in my review, but unless you’ve been completely cut off from social media, you’ve probably seen worse. The new aesthetic is front and center thanks to Naohiro Shintani’s new character designs. After years of awkward body structures and stiff hair that looks like LEGO bananas (as AnimeAjay would say), these new designs simply sing. Seeing them in the trailers doesn’t do the fresh look of Dragon Ball justice. I’ve been rewatching Super with a friend and wasn’t prepared for the stark contrast between the old and new looks. It took a little adjusting, but there is no doubt in my mind that Shintani’s designs are superior in every way to modern Tadayoshi Yamamuro’s. They feel more authentically Toriyama, and even the pallette changes are closer to his coloring style. And the loose hair, proportioned body shapes, and simplistic lines mean these character designs are easier to animate—it’s a win-win situation. I hope with all my heart these Toriyama-approved designs are here to stay. I was also so impressed by the background art in Broly. Each location had such nice detail and perspective depth. I’ve seen planet Vegeta countless times, but when I watched Broly, it felt like I was seeing the Saiyan home world for the first time. The set pieces in Broly also had a large impact on how the characters themselves looked. Changing from frozen tundra to lava back to tundra meant entire color pallettes morphed, not just how darkly shaded a character was. There is a moment close to the beginning of the film when a cloud drifts over a casual conversation and the characters shading changes. Simply marvelous. The animation was delightful. There were so many small moments that drew me in and made me smile. The way Freeza’s tail flicked when he was thinking, the way Paragus’s tail clenched when he was angry. Goku’s delightful bouncing and facial expressions made it feel like he’s still that same Saiyan with a staff from so long ago. So much love and care went into the fight sequences. My only wish was that some of the action in the climax was a bit slower. I was dazzled, awestruck by the talent and time those sequences were created with, but at points the animation was so fast I couldn’t follow it. And unfortunately for me, I won’t be able to properly digest those sequences for quite some time. I went ahead and watched the movies from back then, and I felt this could be quite interesting once I got right to work trying my hand at a story that incorporates him into the Dragon Ball Super series. While keeping in mind Broly’s classic image so fondly in the more fascinating Broly. When I read this, I basically heard Toriyama saying, “I’m going to fix it.” And fix it he did. I won’t say more because of spoilers, but Toriyama made Broly work. He’s endearing, easy to empathize with, and, of course, crazy strong. There’s so much potential now that this improved version of the character has been added to Toriyama’s Dragon Ball. The film starts in the distant past, when Goku, Vegeta and Broly are only babies, and incorporates Toriyama’s version of how Goku was sent to Earth, known as Dragon Ball Minus. Controversies with the Minus story aside, its inclusion was interesting, but also rushed in some spots. I found myself wanting more time with Minus, Broly’s backstory, and even Broly’s interactions with the Freeza Force. According to Tatsuya Nagamine, director of Dragon Ball Super: Broly, Toriyama provided a script long enough for two movies. But if this was the case, why is the movie only an hour and 40 minutes? One Piece Film: Strong World, another Toei movie, clocked at an hour and 50 minutes, while One Piece Film: Gold hit two hours. The studio is obviously capable of making longer movies, so I’m a bit confused as to why Broly is so short. For the most part, I enjoyed Norhito Sumitomo’s soundtrack for the movie. As most fans know, he’s capable of epic sweeping themes and downright cringey tracks. A good score supports the movie while also being memorable. I was crossing my fingers, hoping that the classic Z theme, “CHA-LA-HEAD-CHA-LA,” would be incorporated into the movie—and it was. The lighter pieces felt appropriate without being obnoxious. The only track I didn’t enjoy was the relentless chanting of “Go, Broly! Go!” during the climax. Some fans liked it. It drove me crazy. I would’ve preferred the use of the movie’s main theme song, “Blizzard,” over that unyielding chanting—it still disappoints me the song is nowhere in the actual film. Nitpicks aside, this movie was thoroughly enjoyable, and I loved it. Dragon Ball Super: Broly is certainly the best-looking Dragon Ball film to date, has a solid story, and is already breaking anime box-office records. 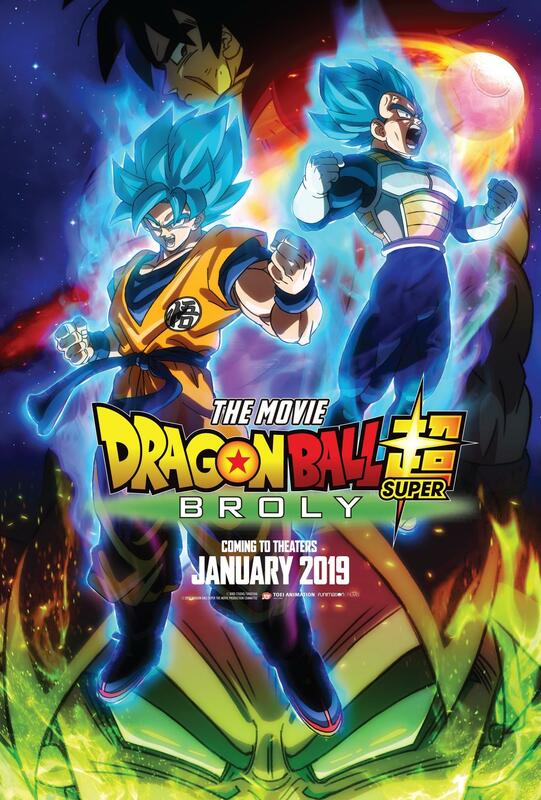 This movie deserves to be viewed on the biggest screen possible, so even if you’re a casual Dragon Ball fan who hasn’t kept up with Super, go watch this movie before it leaves the theater. You won’t regret it.